Today marks my first decade of being a rabbi. Rather than wax nostalgic about the past ten years of my rabbinate in which I still had my rabbi training wheels on, I'd rather use that significant day in my life to comment on two events in the news this week. 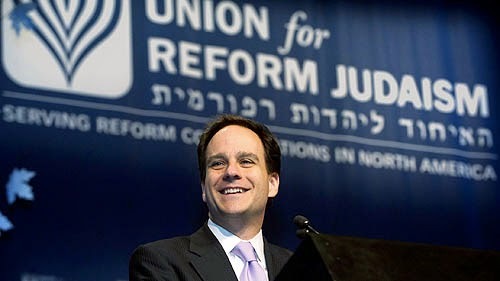 First, Jonah Pesner, a Reform rabbi, traveled to London to be a guest of honor at the Liberal Judaism biennial there. What happened to him at the airport, however, is something that has happened to many non-Orthodox rabbis in the past. The Jewish Chronicle reported yesterday that after Rabbi Pesner told an immigration officer at the airport that he is a rabbi, she looked at Rabbi Pesner and remarked, "You don't look like a rabbi." Perhaps, this comment could just be written off as ignorance, but comments like that are too problematic to just ignore. It would be highly offensive if I looked at a female police officer (or a female airport immigration officer for that matter) and said, "You don't look like a police officer" because she's not a man. The comment made to Rabbi Pesner was made because he is clean-shaven and doesn't wear a black hat. What's interesting is that there are thousands of clean-shaven, non-black-hat-wearing rabbis in this world. In fact, the majority of rabbis represented in movies and on television are non-Orthodox rabbis. Look above at the photo of my classmates at the Jewish Theological Seminary. These are rabbis and cantors who graduated on May 20, 2004. While these men and women don't look like the stereotypical rabbi, we are the leaders of the Jewish community today. Before making her offensive comment to Rabbi Pesner, the female immigration officer at London's Heathrow Airport should have considered that she doesn't have the traditional look of a law enforcement officer. Rather than make a snide remark to Rabbi Pesner, she could have engaged him in a conversation by explaining that the image of a rabbi that she has in her mind is a different representation than how he looks. And that brings me to Macklemore. I'm a fan of Ben Haggerty's rap music. Better known by his stage name "Macklemore," the 30-year-old has gained fame in the past couple of years for his chart topping songs. In the past, I've praised Macklemore for his gutsy song "Same Love" that advocates for gays and lesbians, and is the first prominent rap song to condemn homophobia in hip-hop and in pop culture in general. This past January I was a guest at a private concert in Las Vegas featuring Macklemore and Ryan Lewis where I was very impressed with Macklemore's performance, humor and stage presence (after his first song of the show, Macklemore looked out at all the cellphone cameras pointed at him and commented that he hadn't seen that many cellphone cameras at a concert since the bat mitzvah he performed at the week before). This past Friday night Macklemore made a poor decision. He wore a mask during a live performance of his song "Thrift Shop" that was overtly anti-Semitic. The mask represents a historically offensive caricature of the stereotypical "Jew" as portrayed in Julius Streicher's Der Stürmer, the weekly Nazi tabloid newspaper. The fact that Macklemore wore this mask for his performance of "Thrift Shop" was not coincidental, but it also does not mean that Ben Haggerty/Macklemore is anti-Semitic. He made a poor choice and probably didn't realize how offensive it would be. (Macklemore often performs in costume as a "redneck” named Aberdeen Washington for his song "American" and that costume/persona could be offensive to certain people as well, but there's not the same history of persecution that exists with the racist Jewish caricature that he wore Friday night). Similarly, twenty years ago when actor Ted Danson put on blackface for a Friars' Club roast of Whoopi Goldberg (whom he was dating at the time) he made a horrible choice in dressing in a historically racist costume, but it didn't mean that he was racist. On Friday night we had a surprise show at the EMP Museum in Seattle. Earlier in the day I thought it would be fun to dress up in a disguise and go incognito to the event, so that I could walk around unnoticed and surprise the crowd with a short performance. I picked up a bunch of fake mustaches and beards and grabbed a left over wig from our recent trip to Japan. As it turns out the fake noses they sell at the costume store are usually big (my nose didn't fit most of them). So I ended up with a big witch nose. I went with a black beard, because that's the furthest color from my natural hair. Disguise was the intention. I personally thought I looked very ambiguous in terms of any "type" of person. Some people there thought I looked like Ringo, some Abe Lincoln. If anything I thought I looked like Humpty Hump with a bowl cut. We showed up to the event, I hit the stage in the outfit, rocked two songs, took pictures and went home. We had a great time and it was fun to be a surprise guest in a costume. I've always loved dressing up and have been doing so my entire career. The character I dressed up as on Friday had no intended cultural identity or background. I wasn't attempting to mimic any culture, nor resemble one. A "Jewish stereotype" never crossed my mind. My intention was to dress up and surprise the people at the show with a random costume and nothing more. Thus, it was surprising and disappointing that the images of a disguise were sensationalized leading to the immediate assertion that my costume was anti-Semitic. I acknowledge how the costume could, within a context of stereotyping, be ascribed to a Jewish caricature. I am here to say that it was absolutely not my intention, and unfortunately at the time I did not foresee the costume to be viewed in such regard. I'm saddened that this story, or any of my choices, would lead to any form of negativity. I will let my body of work and the causes for which I've supported speak for themselves. I hope that anyone who may question my intent take a few moments to discover the human and artist that I strive to be. I respect all cultures and all people. I would never intentionally put down anybody for the fabric that makes them who they are. I love human beings, love originality, and… happen to love a weird outfit from time to time. Macklemore signed his open letter "Love, Ben" and then explained that from this negative experience came a positive one because he had the chance to meet with Abe Foxman from the Anti-Defamation League (he also included a link to the ADL's website). So what's the connection between my rabbinical ordination ten years ago today, an offensive comment a Reform rabbi received at the airport in London and Macklemore's unfortunate anti-Semitic costume? Stereotypes are not accurate, but they are hurtful. A quick look at any group of non-Orthodox rabbis today will tell you that rabbis should no longer be characterized as male with long black beards and black hats. The woman at the airport should open her eyes to that reality. And the costume that Macklemore wore at his impromptu concert is not what a Jewish person looks like. It's a caricature -- and an offensive one at that. The immigration officer at Heathrow wasn't being anti-Semitic; she was just relying on a stereotype image of a rabbi. She owes Rabbi Pesner an apology and he could have given her a memorable lesson. Ben Haggerty/Macklemore didn't commit an "overtly anti-Semitic" act the other night. Macklemore wore a historically anti-Semitic mask, which was a stupid move, but it doesn't mean that he is anti-Semitic. As I mark the significant ten year anniversary of my rabbinate, I pray that our society reaches the day when these offensive stereotypes don't exist anymore. We must learn to see each other as we really are, not as how we were portrayed by those filled with hate. Well, I disagree that his apology was perfect. 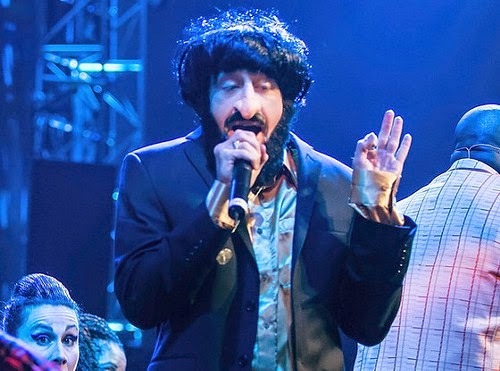 If he dressed in that costume specifically for "Thrift Shop" (a song about being cheap and getting bargains), it was likely an intentional decision to dress like the racist caricature of "The Jew" and that means he's lying about his intentions. If he really did just dress like that for his entire concert and to go unnoticed walking around the venue, I'll give him a pass. Either way, my feeling remains that it was stupid, but not overtly anti-Semitic. Also, not much different than people dressing up as caricatures of Mexicans on Cinco de Mayo.